The simplicity and striking cues of this desk are perfect for those valuing a clean, contemporary style. Polished edges for enhanced durabiltiy and safety. Ready to assemble. Steel wire legs are welded for strength. 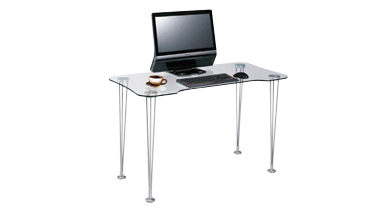 Each leg mounting bracket is permanently fused to the underside of the glass. Adjustable levelers ensure solid footings. . 47-13/64"W x 23-39/64"D x 29-1/2"H.